Is Cat8 really going to be a serious player in the data centre space? How does it compare to the existing fibre technology and is Cat7 now going to be totally overlooked? As you would expect there is already a degree of manufacturer hype, after all, a new cabling standard entering the market place tends to be good news for everyone – manufacturers, distributors and end users alike. However, are we really ready for Cat8 and where will it ultimately fit in the overall network topology? What are the limitations of Cat8 and when can we expect to see this being readily available and deployed? So many questions. Hopefully this article will help to provide some simple facts and suggestions around its intended use. Before looking at Cat7 and Cat8 in more detail it might be worthwhile for us to refresh the existing cabling types and standards. Cat5e still remains a popular choice, as does Cat6. These have both been installed for several decades now and provide speeds of up to 1Gbps, with Cat6 offering the higher bandwidth frequency of 250MHz, both are good for distances of up to 100 metres. 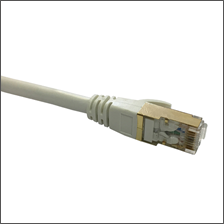 More recently Cat6a has been the preferred choice for core copper networking needs, offering 10x the speed of Cat5e and Cat6 and it comes in a 500MHz shielded construction. With data rate demands and network bandwidth needs constantly increasing Cat6a has certainly established its self as a good fit within the network backbone. Then there’s the Cat7 standard that has been around, but to be honest has gained little momentum and has really been a non-starter. The biggest problem has been that to achieve a certified Cat7 installation you need to use non-standard GG45 connectors, rather than the familiar RJ45 connectors that the industry has been used to. The bandwidth standards were only slightly more at 600MHz, but ultimately it was still a 10Gbps solution for up to 100 metres. 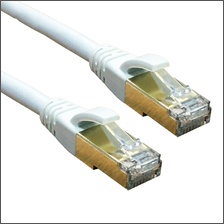 What we have found more popular is regular requests for Cat7 patch cables with RJ45 connectors, therefore effectively a Cat6a solution. In our professional opinion, Cat7 is likely to be overlooked with the emergence of Cat8, except for some legacy installations that have already been implemented. Like with all structured cabling standards, it’s only as good as the equipment that it’s connected to and of course there are advantages and disadvantages to any chosen solution, whether that be installation cost, power consumption, heat dissipation or compatibility with legacy equipment. There is not a ‘one size fits all’ but there is plenty of choice out there and that must be a good thing for any customer base. We have already started to look at several manufacturers that are preparing for Cat8 and have received sample Cat8 cabling for testing. First impressions are the signs look good, better still the market is demanding this new technology. It will use the familiar RJ45 connectors so maintaining industry standards which is great news. Ethernet devices will be able to select a common transmission speed due to its auto negotiation and this in turn will provide a smooth migration path for many years to come. There is already an established place for fibre in the network backbone where speeds are readily available up to 100Gbps, over longer distances and in a smaller footprint. It’s in our opinion that Cat8 is not in any way is going to replace fibre networking, instead like Cat6a before, it will compliment it as a versatile, cost effective environment to help future proof any data centre deployment. We do envisage that over time most of the cabling manufacturers will continue to offer both Cat8 and fibre products in their portfolio, we also see the hardware manufacturers offering connectors to both fibre and copper channels. I think it is fair to say that unlike Cat7, Cat8 is going to be the future of copper cabling. Cat8 channels will provide transmission speeds of up to 4x that of Cat6a so will provide big potential for data centres, however there are several limitations and considerations to cover in more detail. By far the biggest topic of conversation currently is the distance limitations of 30 metres, including local patch cables. This technology is going to sit purely in the data centre environment, providing top of rack and end of row panel to panel links, as well as switch to server connections, being more cost effective than QSFP+ and Twinax modules at faster speeds, in some cases eliminating the need for transceivers all together. When taking in to account the local Cat8 patch cables the real maximum distance for Cat8 runs should be 24 metres, leaving a 3 Metre patch at each end. This will then provide a high level of performance for 25GBase-T and 40GBase-T auto-negotiation networks. Looking at the technical details that have been approved by the TIA Cat8 will have shielded individual pairs, with 2GHz (2000MHz) bandwidth rating, so 4x that of Cat6a and will be limited to two connectors in the copper channel. The power consumption is likely to be equivalent to that of Cat6a over these smaller distances and its heat dissipation is not expected to cause any cooling issues. Finally, let’s look at real scenario of a datacentre wanting to utilise Cat8. Based on a row of 15x 800m server cabinets and then a hop of 3 metre to the next row – this will typically be around 15 metres of cabling under the floor or overhead and then allowing 2.5 metres of the cable to be dressed and terminated in to the rack. Therefore, you will be looking at a Cat8 length of approx. 20 metres, well within the guidelines. Smaller datacentres might decide to take a more resilient approach by installing both an A & B route, even then you could still be within the 30m maximum distance requirements of Cat8 cabling. To summarise, there is certainly a place for Cat8, although it is apparent that many companies will leapfrog Cat7. There is still very much a place for Cat6a at the network core. Cat5e and Cat6 are not about to be retired and remain ideal for wiring the main fabric of any building. Ultimately Cat8 will become common place in the data centre, maybe not in the next year or so but as we approach 2020 we do see this scalable and cost-effective solution providing greater flexibility, alongside fibre at the network core. A new era in structured cabling is born.